Due to lack of time, effort and suitable hosting we've only had a few samples up on this site. From today you'll find more filtering on to fill the void. I'm currently trying zShare to host and the files are deleted if they receive no love or attention so get downloading - it's all free. If an issue is missing or delete and you want it, leave a comment and I'll do my best to reissue it. Enjoy. Featuring - Peter Bagge, Jerry Ordway, Mike Deodate Jnr, Shelton Bryant, Goscinny & Kurtzman, Mauricio de Sousa and lots more. 62 pages. Featuring - Fabien Nicieza, Studio Clamp, Wertham, Roger Langridge, Guy Davis, Ashley Wood, The Norm, Norway, Thunderbolts. 66 pages. Featuring - Glenn Dakin, Brazillians, John Buscema, Angouleme, Frank Miller, 2000AD, Mike Collins, Dragonball, John Charles, Dan DeCarlo. 64 pages. Featuring - Alejandro Jodorowsky, Simon Furman, Dean Haspiel, Ralf Konig, Rex Mundi, Mike worley, Steve Ditko. 64 pages. 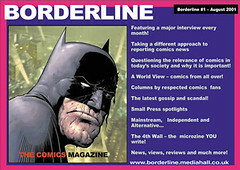 Borderline - The winner of the Best Comics Magazine or Website in the 2002 National Comics Awards - is on the verge of closing down after an 11th hour rescue attempt was scuppered. 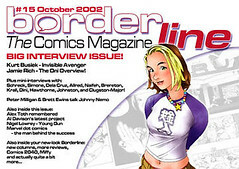 Borderline's editor, Phil Hall, had been in negotiations with a UK publisher to turn the award-winning PDF magazine into a newsstand distributed print magazine, but despite the publisher's valiant attempts, the plan hit the ultimate stumbling block when its distributor refused to take the comics magazine, claiming that there 'isn't a market for it' after 3 previous newsstand comics magazines had failed (the last of those being Comics World which folded in 1994). We've got degrees of disappointment within the editorial team, some of them are just gutted. It means that my involvement with the magazine is coming to an end. I'm over 3K in debt and with no income in sight, I have to get a job, said Hall. But, as disappointed as I am, I'm damned proud of what my team and I have achieved, this has certainly been a year to remember. 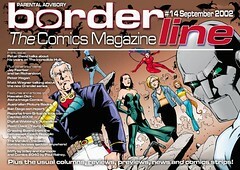 Borderline needs operating and production costs to exist, mainly due to the workload of the main editorial team, who give all their time for nothing. But unfortunately the project has been dogged with bad financial luck. After signing a deal with Cool Beans World, the multi-media company went bankrupt owing over £2.4million and that announcement coincided with the arrival of Borderline's first pay cheque (which of course bounced, compounding the editor's woes). Attempts at attracting advertising have been beset by a lack of understanding from the industry. There is little doubt that the downloadable PDF has had an incredible impact on the comics industry both for the fans and the creators. Many artists spotlighted in Borderline's Drawing Board and Young Guns features have been offered good jobs at the majors. The magazine has increased the profiles of many small press and independent creators, who would never have had the chance to see their work shown to a huge audience. It has also showcased comics from countries that most comics fans in the USA and UK weren't aware had comics industries. Yet, for all of its educational properties, it is still one of the most entertaining and professionally produced fan works ever produced. Borderline isn't finished, there are people who are prepared to carry the flag, but ideally the people who should be running this magazine are those that created it. Every website needs to mention the key points so the search engines know what to look for - so below is just a list of features from the Borderline Comic Magazine that I will update when I get the chance. 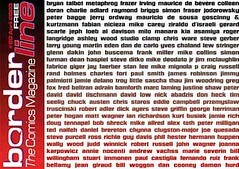 Each issue was over fifty pages so the features listed are just the larger interviews and focus pieces - each issue of Borderline contained regular columns, reviews and news in addition to what is mentioned below. 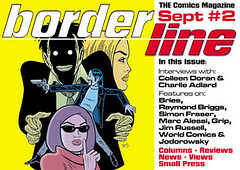 Borderline Issue #3 : Harvey Kurtzman, Mauricio de Sousa, Peter Bagge, Jerry Ordway, Mike Deodato Jr, Shelton Bryant.